The Addi Turbo family of circular knitting needles are the ultimate circular needles for knitters of all skill levels. Made of nickel plated brass with soft, pliable cables connected via snag-free joints, these wonderful needles increase your knitting speed. Addi Turbo needles are unconditionally guaranteed by the manufacturer. Regular Addi Turbo Circular Needles the standard in quality circular needles. Addi Lace Circulars with sharper tips and a surface coating that provides a bit of drag are also available for Lace Knitters. Addi Natura Bamboo Circulars with the natural feel of wood. Addi Rockets & Sock Rockets Addi Lace tips with Nickel coating. Addi Click Interchangeable Circular Needle System lets the knitter build the size and length of Addi Turbo needle they want. 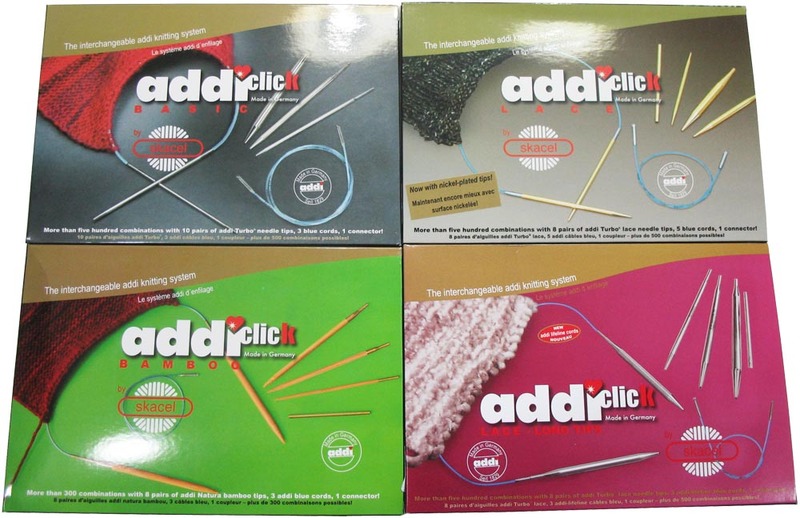 Addi Click Lace lets the knitter build 8 sizes of lace circular needles in a variety of different lengths. Addi Click Bamboo for those who prefer the feel of the Bamboo Natura Circulars. Addi Click Long Lace The same as the Lace clicks but with the full length tips. The interchangeble needle system with the quality of Addi Turbos! 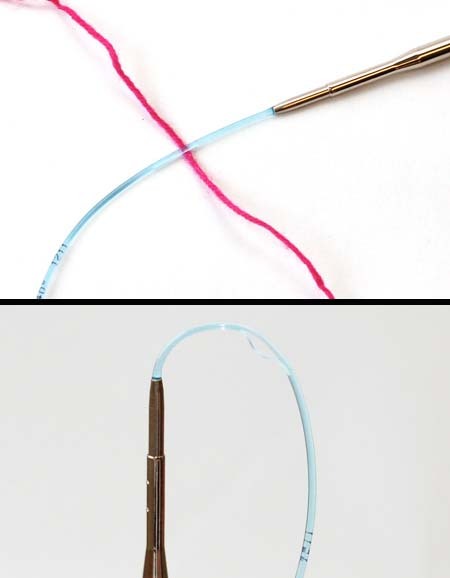 The Addi-Click System provides a collection of needle tips in different sizes, a number of sections of the extremely pliable blue cord to allow the knitter to constuct a wide range of circular needles of varying thickness and length. 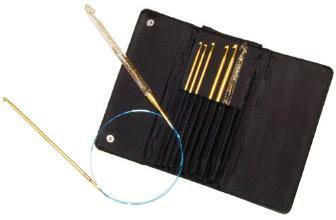 The kits also include a connector piece to help store stitches or combine cords to form a longer circular needle. The Addi Click tips require no tools to change; simply insert the cord deep into the tip, twist and release. The tips will remain secure until you change them. 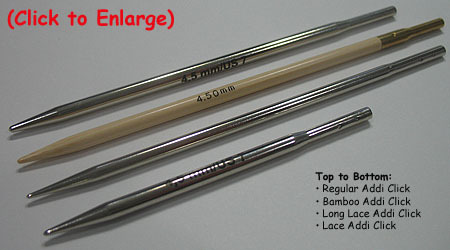 The system means that you will always have the right size and length of needle when you need it. When you discover your gauge calls for a needle one size larger or smaller than you anticipated, you just switch needle tips and you are ready to knit. Like standard Addi circular needles, Addi Click systems come with a variety of tip styles to match every knitter's needs. This includes the regular Addi Turbo design as well as Natura Bamboo, Lace and Long Lace. The Lace Addi Clicks have shorter tips to allow for construction of needles with a shorter length. To see a comparison of the tip styles and lengths, click on the picture below to see a larger version. Except for the Bamboo version, All Addi Click needles are Nickel-plated Brass like the original Addi Turbos. The Lace versions have the sharper tip like Addi Lace needles. 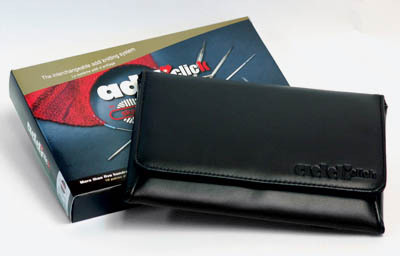 The Addi Click sets come in a high quality soft storage case that is color coded to the particular style of needles. In addition to the basic sets, extra tips (2 per set), additional cords and connectors can be ordered seperately from the tables below. A set of crochet hooks that fit on the Addi Click cables is also available along with Addi's Heartstopper end-caps to complete your set! In addition to the standard Addi Click cords, special SOS Lifeline cords include a handy hidden eyelet that can be used to hold the end of your yarn to avoid dropped stitches. This eyelet is invisible until the knitter grasps the cord on each side of the eyelet and presses together causing it to appear to provide a handy yarn holder. These special SOS Lifeline cords are included standard for the Addi Click Long Lace Set or can be ordered seperately below. * Addi Lace and Long Lace Clicks have the same tip shape as fixed length Addi Lace Circulars but are nickel plated like regular Addi Turbo clicks and fixed length needles. ** Addi Lace Click cords are longer than cords for the other Click sets to compensate for the shorter needle tips. Cables can be mixed but overall circular needle length will be adjusted and shorter cables with the longer needles may not produce an optimal circular needle. * Indicates Needles that are not included in the standard Click Set. * Addi Lace Click cords are longer than cords for the other Click sets to compensate for the shorter needle tips. 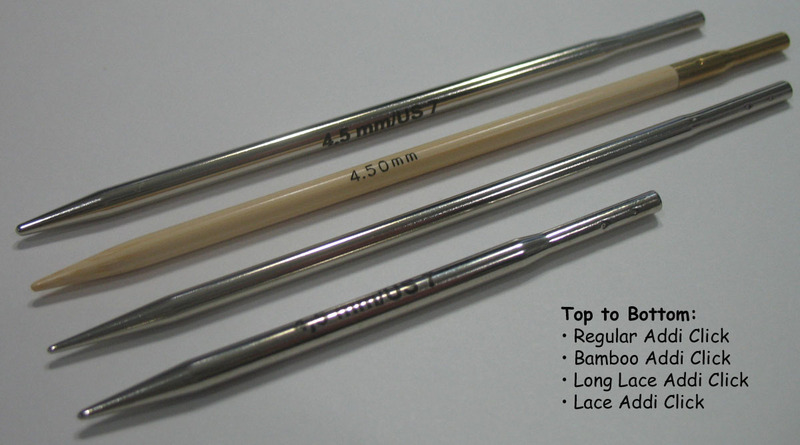 * Either type can be used on any of the 4 needle tip styles but will result in different lengths. * Shorter cables mixed with the longer tips may not produce an optimal circular needle. * SOS Lifeline cordsets provide a special hole to hold the yarn end as shown here. (instead of attaching them to the Click cords). Double Pointed Needles, Susan Bates Circular Needles, Crochet Hooks, Cable Needles, Embroidery Needles and Weaving Needles. We also carry the following accessories: Stitch Holders, Stitch Markers, Needle Gauges, Wool Combs, Mohair Brushes and Point Protectors. About 4-6 times each year we email out a Knitter's Newsletter providing a summary update of what new products are available. Just email us at nmanners@camillavalleyfarm.com if you would like to receive this and we will add you to our mailing list. Note that we also have a seperate newsletter for Weavers as well. We also provide great prices and selection on these fine knitting yarns: Lopi Wool, Jamieson's Shetland Wool, Peace Fleece Wool, Simply Shetland Wool with Silk & Cashmere plus Fleece Artist Kits.